LED Lighting: How to Install LED Strip Lights? How to Install LED Strip Lights? Many people have the problem with the strip light installation. Here, we'll show you how to install LED strip lights. It's very easy to install LED strip lights for indoor decoration. There is a type of LED strip at the back of which there's self-adhesive double-sided tapes. You can install the lights at any place you need by tearing off the double-sided tapes at the back and press it for fixation. What if there is a corner or the strip light is longer than needed? It's a good question. Before we answer the question, you should be clear that every 3 LED of LED strip light is connected in series-parallel way. Thus you can cut the strip light at the place of every 3 LED. As to outdoor installation, led strips with double-sided tape at back are not practical for use. If you use this type of strip light for outdoor application, the light will easily fall off for the adhesion would decrease due to the changing weather. So you need to use a installation slot for fixing LED strips. Then the following installation steps are the same as that of indoor installation. But you need to apply some water-proof glue to reinforce the connection points. The general voltage for strip light use is DC 12V; thus we need use switching power supply. 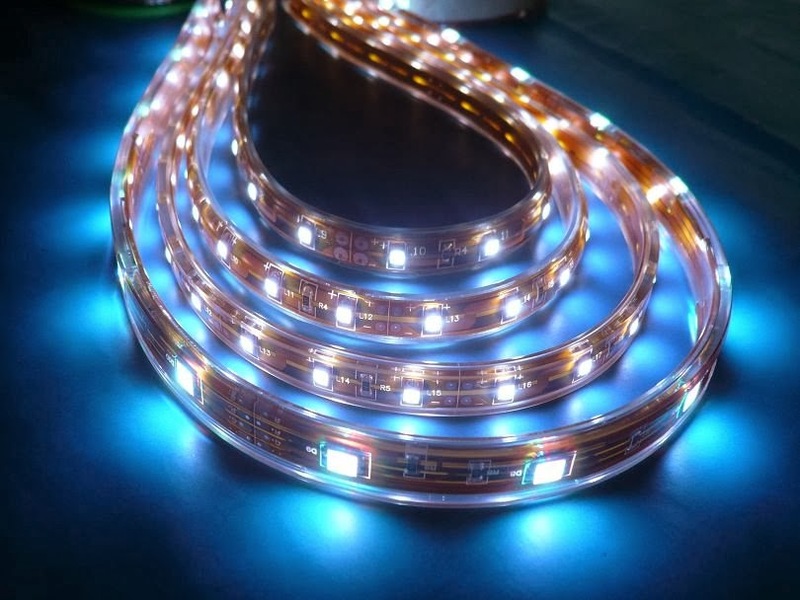 The power should be decided according to the power of LED strip and the connection length. If you do not want use power supply for each LED strip, you can use a bigger power supply as the main power switch, and then make all the LED lights in parallel. The whole circuit's power is supplied by the main switching power supply. The benefit is you can control the whole lighting by one power supply; while the disadvantage is you can not control the lighting effect and power control of each LED strip. We need a controller to control the changing effect of LED marquee strips and LED RGB strips. Usually, the distance of each controller is different from one another. The controlling distance of a simple controller is about 10 to 15 meters; the remote controller's reaches to about 15 to 20 meters. The longest one is up to 30 meters. If the connection distance is out of the controller's controlling distance, then you need to use a power amplifier to solve the problem. Generally, the connection distance of 3528 LED strip lights is up to 20 meters; and that of 5050 LED strips is about 15 meters. If the distance beyond this connection distance, the LED strips will become hot very easily. This will affect the service life of lights. Therefore, we should install the strip lights in accordance with the manufacturer's guidance. "How to Select LED Strip Lights for Home Decoration"
"Difference Between Flexible LED Strip and LED Light Bar"
"Why LED Strip Light Won't Light Up? Troubleshooting"
"How to Choose and Buy LED Strip Lights? Buying Guide"
"Features of LED Strip Light"